Are Canned Salmon & Tuna Good Sources of Omega-3? Both canned salmon and canned tuna can provide you with omega-3 fatty acids, the essential fatty acids that must come from your diet since your body can't manufacture them. Different types of tuna and salmon provide different amounts of omega-3 fatty acids, necessary for neurological development and also helpful in reducing the risk of heart disease. Canned tuna ranks second only to shrimp as the most popular American seafood, according to FishWatch.gov. 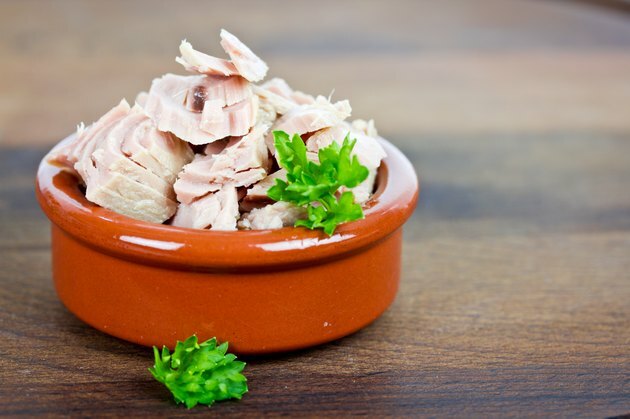 While tuna in general contains a large amount of omega-3 fatty acids, the types of fatty acid and the amounts it contains can vary from one canned tuna type to another. Canned tuna contains 0.17 to 0.24 grams of omega-3 fatty acids per 3-ounce serving, notes the American Heart Association. Albacore tuna canned in water contains up to 10 times as much of the omega-3 fatty acid eicosapentaenoic acid, or EPA as light canned tuna, according to a study published in the October 2004 issue of "The Journal of Food Science." Albacore also contained more docosahexaenoic acid, or DHA. However, albacore canned in oil has the same omega-3 makeup as canned light tuna. You can get wild salmon and farmed salmon in cans. As with tuna, manufacturers sell salmon packed in either oil or water. Eight ounces of salmon supplies the 500 milligrams of omega-3 fatty acids. The USDA Dietary Guidelines for Americans 2010 suggests healthy adults consume 250 milligrams each day for a total of 1,750 milligrams per week. Wild salmon supplies 300 to 650 milligrams of omega-3 fatty acids per ounce, reports Oceana, an organization devoted to protecting the oceans. Salmon contains more DHA and EPA than any type of canned tuna. Canned tuna does not supply this amount of omega-3 fatty acids, researchers from Purdue University reported in the 2008 "Journal of Foodservice." Both canned tuna and salmon may contain methylmercury, a toxin that can accumulate in body tissues. When choosing fish for its omega-3 benefits, it's also important to consider the methylmercury content in the fish, especially if you're pregnant. Methylmercury in large amounts could harm pregnant women and young children by interfering with neurological development. Albacore tuna contains a high level of methylmercury. Canned salmon contains just 0.008 parts per million mercury compared to 0.350 ppm in canned albacore and 0.128 ppm in canned light fish, according to the United States Food and Drug Administration. If you want to maximize your omega-3 fatty acid intake while minimizing your methylmercury intake, salmon gives you the most bang for your buck on both counts. Salmon also has the additional benefit of supplying more calcium, since the soft bones are canned with the meat. Can You Have Salmon or Tilapia When You Are Pregnant?